For the fourth post in our baby storytime series, I’m sharing books and songs and rhymes perfect for newborns. This post is inspired by the influx of newborns in my life lately and I hope you’ll all allow me to selfishly welcome Sidney, Mason and soon Alexander to this great place we call Earth! With these new infants in mind as well as the constant supply I have the pleasure of seeing at work, I thought a post just for brand new babes was more than warranted. If you’re fired up about baby storytime and want to read more, make sure to check out the rest of the posts in the series! Books with large, bright faces! 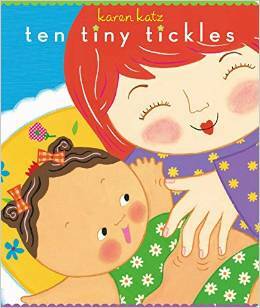 Some great examples include Ten Tiny Tickles and Counting Kisses by Karen Katz, 10 Little Fingers and 10 Little Toes by Mem Fox and the Baby Step Series by Carol McDougall. Newborns seek out and pay attention to faces because it is an important source of information for them and books with images of faces will capture their attention. High contrast and black and white books like I Kissed the Baby! by Mary Murphy and any of the Black and White series by Tana Hoban are also fantastic for little babies. 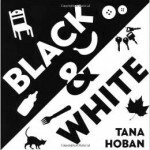 The contrast between bold colours or black and white in the illustrations gives baby something to focus on which helps strengthen their eyesight. One tip we like to share with caregivers with infants is from Library Bonanza’s Early Literacy Talking Points (seriously bookmark this page!) “For a baby’s short attention span, reading shouldn’t be done in one sitting but throughout the day. That’s why it’s important to always keep a book handy. Read when you and your child are relaxed and happy.” For more book ideas check out our Babytime Books and Songs Pinterest Board or SLJ’s recent Board Book Round-up for what’s new and hot in the board book world. The Moon is Round: This lovely song is gentle and soothing and perfect for newborns. Have parents sing it through once and point out the parts of their face and then again while they gently touch baby’s face. Peek a Boo: This is such a great song for new infants for a couple reasons. First off, because of babies’ attraction to faces, they will tune in when parents make their face disappear and reappear. Also, this begins to model the verbal convention of taking turns. Encourage parents to make big silly faces and let their baby react. By pausing after they draw their hands away, they’re letting baby know it’s your turn and I’m listening. Ride Baby Ride: While lap bounces and dancing songs are a lot of movement for newborns we love this song because of the playful language. I wouldn’t have parents of newborns bounce to this one, instead I would suggest that they pat baby’s back or chest while they’re held close. Babies will begin to make cooing and gurgling noises at two months and parents can encourage these noises by singing songs with silly sounds or ending a rhyme with a tickle and a coo. 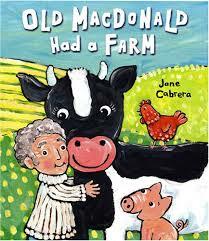 What are your favourite songs, rhymes and books to recommend to parents of newborns? What tips do you send home with these little bundles? Drop us a line in the comments below and stay tuned for our next Baby Storytime post! For the third post in our baby storytime series, I’m sharing my favourite lap bounces. Make sure to check out the rest of the posts in the series! If your baby is up for it, try turning them so they face you as they bounce. This allows them to watch your mouth as you sing so they can see how you form the sounds and words that make up your language. Bounces are a great way for children to feel the beat with their entire body in addition to hearing the rhymes. A steady beat is reminiscent of their mother’s heartbeat, a sound that provided them comfort in the womb. Walking, running, and dancing all require the body’s ability to keep a steady beat. So by doing lap bounces with your baby you are getting them ready for this later developmental stage. Lap bounces allow us to be close to our babies by holding them on our laps and giving them hugs and cuddles. This is a great chance to build a positive, loving relationship with your baby which is the foundation for learning. And here are some of my favourites! This one is so simple – perfect for when you have a group of new babytimers. When my niece was 2-years-old she always used to say, “bumpy road!” whenever we went over a part of the road that jostled her in her stroller. Proof that this one works! To the tune of “Shortnin’ Bread” this one is catchy. I sing it three times through – pants, shirt, and hat. I always encourage caregivers to sing this one daily to establish a getting dressed routine. The best is when I hear them singing it on their own when they are packing up baby to leave the library. This one is so fun! The caregivers love it and sometimes we do it multiple times throughout the babytime. A lot of people in Vancouver take transit, so I encourage them to sing it while riding the bus. A classic! There’s a second verse I started doing where you tip babies to the side and sing, “One wheel’s off and the axle’s broken, one wheel’s off and the axle’s broken, one wheel’s off and the axle’s broken, won’t you be my darling?” We also have a winter version of this song and a space version too! It’s fun to take an old classic and adapt it for babies. Most of the caregivers know the words and tune to this one – we just made it more fun! If I’ve got a group of particularly active or rambunctious babies, I always do The Grand Old Duke of York. Sometimes bouncing just isn’t enough and the babies want to be lifted. For younger babies, I recommend just moving their arms or legs up and down. This one also combines bouncing and lifting, but it is less well known than the Grand Old Duke. I still think it’s lots of fun and a great one to introduce to babytime groups who are ready for some new material. Want more lap bounces? Check out our YouTube playlist or our Pinterest board. What are your favourite lap bounces for baby storytime? Let us know in the comments! Before we begin, a quick word on fingerplays and tickles. What are they? And when do we use them? I like to think of fingerplays as a chance to encourage baby to play with their hands and fingers and for adults to model some neat-o things they’ll be able to do with them real soon. Tickles on the other hand (I went there!) are a special type of fingerplay which allow caregivers to engage in play with even the smallest infant as they touch and show affection and get sweet, sweet giggles and smiles in return. I use them throughout baby storytime, usually at the beginning to let parents know I mean business when I say this program is a time for them to play and connect with their child. 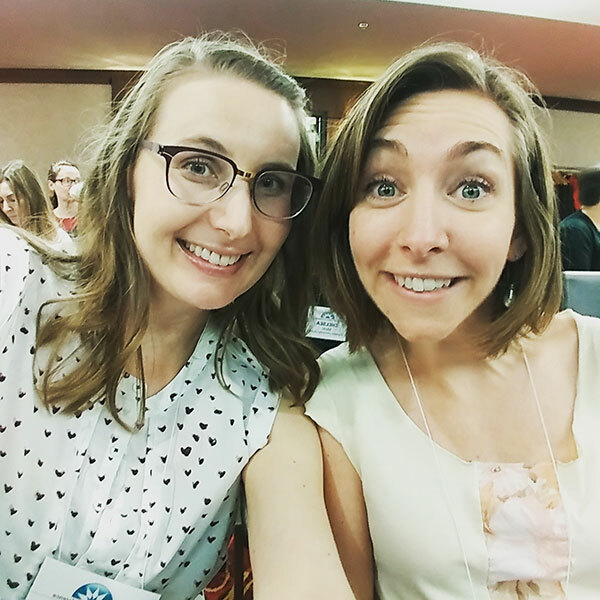 I will use them again about halfway through to re-focus and re-engage caregivers which I explore more in this post. 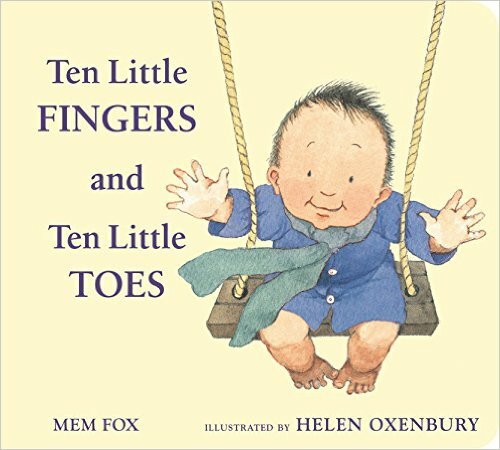 Now that you’ve all had your duckie kisses (stop and read Lindsey’s post if that went over your head) let’s get into our favourite fingerplays and tickles to use at baby storytime! 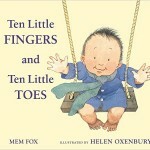 Counting rhymes and songs are often the easiest way to start incorporating fingerplays. We love this one because it’s a little more involved with a pop at the end and then feel free to try our Two Little Blackbirds rhyme and 1 Little, 2 Little, 3 Little Fingers for more counting goodness. One fingerplay which doesn’t really involve counting but we think fits this category is Come ‘a’ Look ‘a’ See. Use each finger to name a family member, sweet as can be! With these rhymes you can remind families that no matter what type of learner their child is, counting on their fingers catches their interest and employs both visual and kinetic learning. The final type of fingerplay and possibly the most serious business your hands can be involved with: playing peek-a-boo! This one is fun to do with scarves or just with hands but it’s always a hit. Another weather themed peek-a-boo to try is Rain is Falling Down. The early literacy tip which we like to share when playing peek-a-boo is that infants have not yet learned the concept of object permanence so when something “disappears” it’s truly gone for them, making their smile that much bigger when you return! NPR also wrote a great article on why surprising your baby can lead to learning. 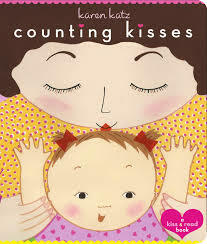 This is an awesome tickle for so many reasons: we love the counting and shrieking (gently of course…) THEY’RE ALIVE! While this might feel like a long rhyme for an infant we like to tell parents that when they do it at home their child will start to remember the rhyme and look forward to the tickle at the end. This ability to recognize and predict sets them up to be strong readers down the road. This is a lovely hands-on rhyme, ending with a tickle in the armpit or under the chin. Another perfect opportunity to tell parents that children learn in different ways and feeling their touch slowly and then quickly helps to reinforce these concepts. You can also sneak in an early literacy tip about phonological awareness – when we say the word”slowly” our voices change pitch, making it easier for babies to hear the sounds that make up our language. We learned this one at our Guerrilla Storytime and have not looked back since. It’s both a diaper changing song and a tickle, making it indispensable to all parents! This is a lovely tickle which parents can learn when their child is an infant and continue as they get older, making it more and more elaborate. We’ve collected these songs and rhymes (and more!) in our Fingerplays and Tickles playlist but we’d love to hear more about your favourites. Which ones do you use? Please leave us comments below and stay tuned for the next post in our baby storytime series. At my library, baby storytimes (lovingly referred to as babytimes) are advertised for ages 0 -18 months. Because babies vary so greatly in development, I often tell parents with super active 17-month-olds that they may enjoy a toddler or family storytime more. The majority of the babies who attend can’t walk yet, and the focus is on helping caregivers develop a loving relationship with their child. This actually starts 5-10 minutes before babytime officially begins. It’s something I just started doing, but I’ve gotten such a great response that I’m definitely going to keep it up. 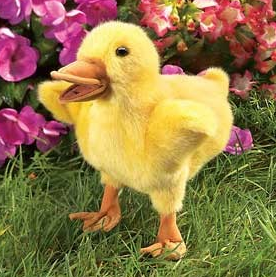 As caregivers and babies arrive and get settled, I personally greet them and give baby a kiss on the hand or cheek with my little duckie puppet. If it’s one of my big babytimes with over 40 babies, then I reach as many as I can and catch the rest afterwards. Why do I give welcome puppet kisses? It gives me a chance to learn each baby’s name. It makes me more approachable, and the babies seem to warm up to me sooner. It models play to the caregivers. 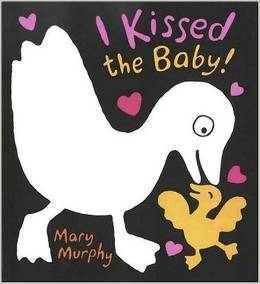 Last week one mom told me should would have never thought to use a puppet with her baby, but her baby laughed each time duckie kissed her and she was sold. Unfortunately I have to cut this part out if the group gets too big just because it takes too much time. But if I have less than 15 babies, I have the caregivers go around and say their name, the baby’s name, and the age of the baby. If the group is really small, then I’ll also ask them to share something about their baby – a recent milestone, a like or dislike, etc. Not only does this help solidify the baby’s name in my mind, it also helps create a sense of community for the caregivers. I often find them chatting after babytime about something someone mentioned during this part. This is a must-sing! We wake up our feet, hands, ears, and hair. I tell caregivers that this is a great song to sing in the morning when baby first wakes up or when they are changing their diaper. Another one we do every single week. My friend and co-worker Saara taught me this one and it is brilliant. Also works swell with toddlers! For my smaller groups, I love singing this song and adding in each of the baby’s names. You can sub in other actions for “clap” too such as bounce, jump, stomp, and hug. An easy tune, lots of repetition, and another great song to teach caregivers for cranky baby mornings! This last one is definitely more of a challenge, but it’s got such great sounds in it. It works best if you sing it every single week and provide caregivers with the lyrics. 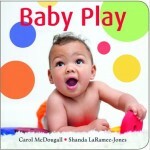 If you’ve got a babytime group that’s ready for something new, this would be a great one to introduce. So that’s how I start my baby storytime. What do you do? Please let me know in the comments! Recently on the Storytime Underground Facebook group, people have been asking questions about how to run a baby storytime. Baby storytime is also known as simply babytime or lapsit. Yes you get to be surrounded by super cute babies, but I find interacting with caregivers, especially with regards to providing early literacy training, a key component to a successful babytime. I thought I’d create a resource guide for anyone new to the field or just starting a baby storytime at their library. As always, please leave a comment with your ideas or links to resources I can add to this list. Please note, these links will take you directly to their baby storytime pages or blog posts. Burnaby Public Library’s Babies Love Books! As an on-call librarian, I do many babytimes throughout Vancouver to groups of many different sizes. Since July I’ve had the opportunity of providing the baby storytime to one particular branch each week, allowing me to cultivate relationships, grow the attendance, and try new things. On average, I get about 20-30 caregivers + babies per week which is a great number for me. I’ve been able to adapt my babytime to meet the needs of this group, and I’m excited to share how I’ve changed things up since last summer. So you liked The Elevator Song eh? Well you are in good company; pretty much every family here in Vancouver seems to love it too! It’s part workout and part awesome-sauce. But what about when it’s over? How do you keep those parents and wriggly-giggly things (thanks Mary Murphy!) happy? We have come up with a list to try and fill that void! 1. What Shall We Do With Lazy Katie? This gem allows for not only lifting but also some dipping, swaying and tickling! We like to encourage parents to sing it with their child’s name resulting in a chorus of names being sung out. This is a very simple lift and kiss tune with a gentle hug at the end. This one can be done while parents are sitting or standing. Another smash hit in Vancouver, Zoom, Zoom, Zoom starts all normal-like and then blasts off into space! Parents can start this one as a bounce and then (gently) launch baby into the air at the end. This was a definite hit for the fall and winter here in Vancouver. You can encourage parents to lower baby between their legs instead of lifting on this one as the leaves (aka baby) fall or drift gently to the ground. So not only should this video win Best Thumbnail Image Award 2013, but it’s also one of our favourite babytime songs. You can tell parents to rock side to side on the tick, tock and then pop baby up above when the toast is done! We don’t have this one filmed yet, but Lindsey will be singing this with the adorable Blake very soon. This one works well for lifting while sitting, as well as dipping baby left or right. You’re neither up nor down! Oh, what a silly sight! This is another one which we plan on filming over the holidays, when Lindsey has access to baby Blake. In this song caregivers can drop baby down between their legs, instead of a lift. For more Movement and Dancing Storytime Song ideas check out our playlist here! These are the songs and books I used for a 30-minute babytime. You can hear all of the songs and rhymes by clicking on the Watch Here links. I tend to focus more on songs and rhymes in babytime, so I only used these two highly interactive books. The caregivers helped me sing Old MacDonald and I snuck in an early literacy aside about using animal sounds to develop phonological awareness. Anything by Karen Katz is great and this one encourages caregiver-baby interaction, a great choice for supporting print motivation as the babies grow older. I start at the bottom of the body and work my way up with knees, hips, arms, head, and ears. This is the way the ladies ride. Oh I wish I was a little bar of soap. Make sure to check out the video to learn the signs and how I teach them to caregivers. And when it’s wet, I get upset. For the first part of this song, I ask caregivers to swing baby into the center of the circle so they get to see each other up close. For the second part, they turn and face another baby. Caregivers lift baby up and down as the elevator moves. on a little piece of land. Wake Up Feet is an excellent welcome song as caregivers are able to pick it up quite easily. I asked for a few suggestions on what body parts to wake up and added in shoulders and nose. Many of the songs we did 3-5 times, especially the ones that had babies laughing. You Roll It was a baby favorite. I wasn’t planning on doing two movement songs, but I asked for any caregiver requests that they really wanted to do The Elevator Song so we added it in at the end. Last thing to note is that although the caregivers don’t tend to check out many books, they were all over the CDs I talked about featuring pop music (Madonna, Red Hot Chili Peppers, you get the idea). Definitely going to keep having those ones out at babytime!